Leah came to the Fellowship with a desire to build community and hone the skills that she was learning as an organizing intern at the Somerville Community Corporation and working at The Welcome Project. Through the Fellowship, these two things — community and professional growth — came together for her. She also discovered an extended network of alumni, trainers, and Fellows who shared her need for a strong progressive Jewish voice. Today, Leah continues that work as an organizer at the Boston Workmen’s Circle. “The young adults cohort at the Workmen’s Circle really began to solidify as a community during a series of house meetings. These house meetings, organized as part of a broader campaign put on by the Greater Boston Interfaith Organization (GBIO), took place in the spring of 2009 as the economic crisis was really hitting home. “We asked each other the question: ‘How are you feeling the effects of the economic crisis?’ I sat in the living room listening to stories emerge, one after another: Adam had recently lost his job as a healthcare advocate; Jill was buried in student loan debt; Rob felt burdened by the need to support his unemployed parents. We listened to each other’s stories and decided that we could help each other to be resourceful and spend less. We launched a series of skill shares where we taught each other things like bike maintenance, financial planning, and healthy-eating on a tight budget. Together with other young Jews in Boston, Leah and the Workmen’s Circle helped bring over forty people to a huge public action run by GBIO with the Massachusetts Treasurer and Candidates for Treasurer in 2010. At this meeting, the over four hundred participants got the Treasurer and Candidates to agree to remove over $230 million of taxpayers’ money out of Bank of America (which was charging interest rates beyond the Massachusetts State limits). People across race and class lines organized to put a check on unreasonable interest rates and the banks that charge them. Leah was able to do her part to win this victory against big banks because of the Fellowship trainings she had on campaign strategy, power and building strategic relationships. 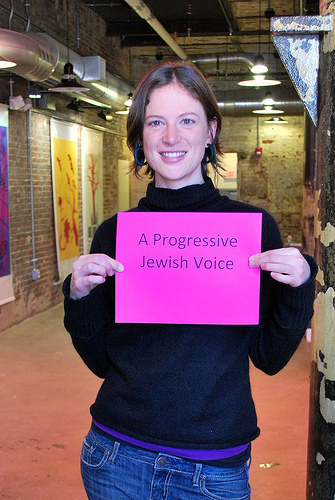 Leah is fighting for a progressive Jewish voice. What will you fight for?